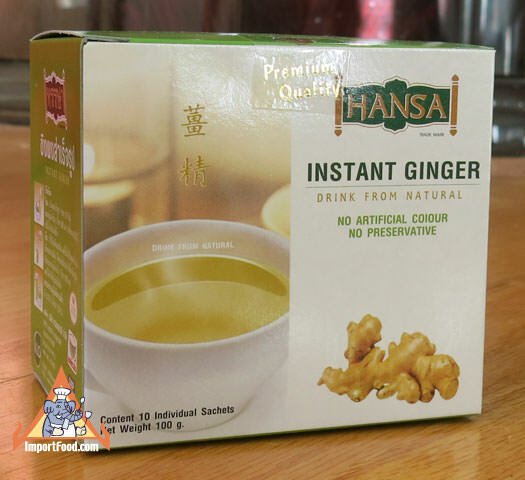 Premium quality Hansa brand Thai instant ginger tea. Enjoy the taste of ginger in a warm delicious drink, perfect for cold nights around the fire. As a health remedy, ginger reduces stomach gas and eases pains, aids digestion, and helps with motion sickness. Ingredients: 80% ginger, 20% sugar. When dissolved in 1 cup of water, the result is 5.33% ginger, 1.33% sugar. No artificial flavor or preservative. 10 modern foil sachets, 10 grams per sachet. We also offer Hansa brand Bael Fruit drink.